There's so much to love about Rachella by Mona B. The upcycled canvas constuction gives Rachella the look of a well-traveled, favorite bag. She is ready to start her new adventure with you. Rachella offers lots of space and storage compartments in a compact sized bag. The leather magnetic flap opens the bag to reveal 3 compartments. The middle compartment has zipped closure, cotton lining, and a large open pocket. On either side of the middle main compartment are two spacious open compartments for easy access to phone, keys, etc. On the front of the neutral olive-gray canvas bag, there is also a cotton-lined open slip pocket, as well as a pierced brown leather accented border. 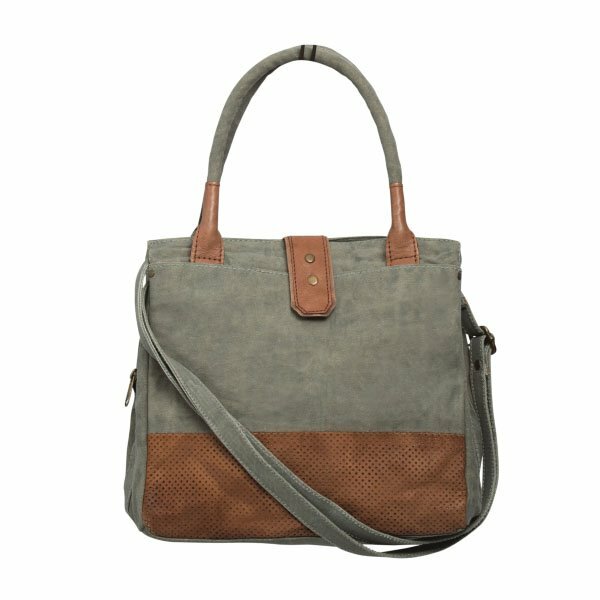 Canvas handles with 6" drop, as well as canvas shoulder straps with 11" drop give comfortable carrying options. Measures 11"W x 10.75"H x 4"D. Made from up-cycled canvas. The fabric shows the history of its travels which may include stitch marks, minor staining and unique scars and bruises. Color variations and patches add to the uniqueness of each bag. Heavy cotton canvas and genuine leather.